These are the thoughts of Noam Chomsky regarding the Snowden affair. What is clear to all citizens, is that the sheer depth of penetration into our personal lives is stunning and essentially for no other reason but because they could. Worse, the decision to exploit this data was anyone with simple access such as Mr. Snowden. Any amount of this data could be sold or used maliciously by someone so inclined. Now, is that not the clearest definition of the right to privacy? 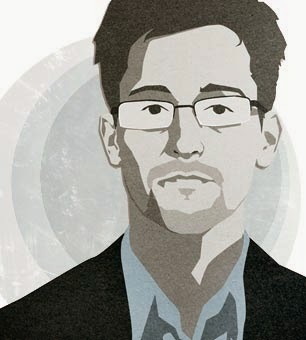 Snowden chose to act, not because it was right or wrong, but because he could. Think about that for a moment. A single individual could upload the entire log and deal it. That this was possible is like having the button for a nuclear bomb and giving it to whoever. He clearly made his point and is letting the press confront the enormity of the crime committed by the NSA. Noam Chomsky | Edward Snowden, the World's "Most Wanted Criminal"
The source of the instruction, of course, is the trove of documents about the National Security Agency surveillance system released by the courageous fighter for freedom Edward J. Snowden, expertly summarized and analyzed by his collaborator Glenn Greenwald in his new book , "No Place to Hide." The documents unveil a remarkable project to expose to state scrutiny vital information about every person who falls within the grasp of the colossus - in principle, every person linked to the modern electronic society. Nothing so ambitious was imagined by the dystopian prophets of grim totalitarian worlds ahead. It is of no slight import that the project is being executed in one of the freest countries in the world, and in radical violation of the U.S. Constitution's Bill of Rights, which protects citizens from "unreasonable searches and seizures," and guarantees the privacy of their "persons, houses, papers and effects." Much as government lawyers may try, there is no way to reconcile these principles with the assault on the population revealed in the Snowden documents. It is also well to remember that defense of the fundamental right to privacy helped to spark the American Revolution. In the 18th century, the tyrant was the British government, which claimed the right to intrude freely into the homes and personal lives of American colonists. Today it is American citizens' own government that arrogates to itself this authority. Britain retains the stance that drove the colonists to rebellion, though on a more restricted scale, as power has shifted in world affairs. The British government has called on the NSA "to analyse and retain any British citizens' mobile phone and fax numbers , emails and IP addresses, swept up by its dragnet," The Guardian reports, working from documents provided by Snowden. British citizens (like other international customers) will also doubtless be pleased to learn that the NSA routinely receives or intercepts routers, servers and other computer network devices exported from the United States so that it can implant surveillance tools, as Greenwald reports in his book . As the colossus fulfills its visions, in principle every keystroke might be sent to President Obama's huge and expanding databases in Utah. In other ways too, the constitutional lawyer in the White House seems determined to demolish the foundations of our civil liberties. The principle of the presumption of innocence, which dates back to Magna Carta 800 years ago, has long been dismissed to oblivion. Recently The New York Times reported the "anguish" of a federal judge who had to decide whether to allow the force-feeding of a Syrian prisoner who is on a hunger strike to protest his imprisonment. No "anguish" was expressed over the fact that he has been held without trial for 12 years in Guantanamo, one of many victims of the leader of the Free World, who claims the right to hold prisoners without charges and to subject them to torture. These exposures lead us to inquire into state policy more generally and the factors that drive it. The received standard version is that the primary goal of policy is security and defense against enemies. The doctrine at once suggests a few questions: security for whom, and defense against which enemies? The answers are highlighted dramatically by the Snowden revelations. Policy must assure the security of state authority and concentrations of domestic power, defending them from a frightening enemy: the domestic population, which can become a great danger if not controlled. It has long been understood that information about the enemy makes a critical contribution to controlling it. In that regard, Obama has a series of distinguished predecessors, though his contributions have reached unprecedented levels, as we have learned from the work of Snowden, Greenwald and a few others. To defend state power and private economic power from the domestic enemy, those two entities must be concealed - while in sharp contrast, the enemy must be fully exposed to state authority. The principle was lucidly explained by the policy intellectual Samuel P. Huntington, who instructed us that "Power remains strong when it remains in the dark; exposed to the sunlight it begins to evaporate." Huntington added a crucial illustration. In his words, "you may have to sell [intervention or other military action] in such a way as to create the misimpression that it is the Soviet Union that you are fighting. That is what the United States has been doing ever since the Truman Doctrine" at the outset of the Cold War. Huntington's insight into state power and policy was both accurate and prescient. As he wrote these words in 1981, the Reagan administration was launching its war on terror - which quickly became a murderous and brutal terrorist war, primarily in Central America, but extending well beyond to southern Africa, Asia and the Middle East. From that day forward, in order to carry out violence and subversion abroad, or repression and violation of fundamental rights at home, state power has regularly sought to create the misimpression that it is terrorists that we are fighting, though there are other options: drug lords, mad mullahs seeking nuclear weapons, and other ogres said to be seeking to attack and destroy us. Throughout, the basic principle remains: Power must not be exposed to the sunlight. Edward Snowden has become the most wanted criminal in the world for failing to comprehend this essential maxim. In brief, there must be complete transparency for the population, but none for the powers that must defend themselves from this fearsome internal enemy.